This was an incredible moment. If you stumbled here by mistake, go away right now! You need not be here until you have watched GOT episode four. So what really happened in the latest Game of Thrones episode. Amidst everything else that we are conveniently skipping here today, we only and only want to take about the part when Daenerys Targaryen burnt the Dothrakis. All of us have been annoyed about the fact that our Khaleesi hasn’t really got the kind of action until now, but episode four gave us much more than our appetite. So as Dothraki leaders got together to decide what they must do with our super girl Daenerys, she managed to escape their captivity and how!! What really caught our interest is the risky technique she applied to do so. She set the entire temple of fire while she was in it. And while the Dothrakis were roasted to death, our Khalessi escaped from there scratch free. And just like that Dany didn’t only set the temple of fire, but the internet as well. This was “the moment” and it was extremely empowering. While she walked out of the temple everyone bowed down to her and the scene could give you big goosebumps. It is established in the show therefore that Dany is definitely immune to fire. How did this happen then? 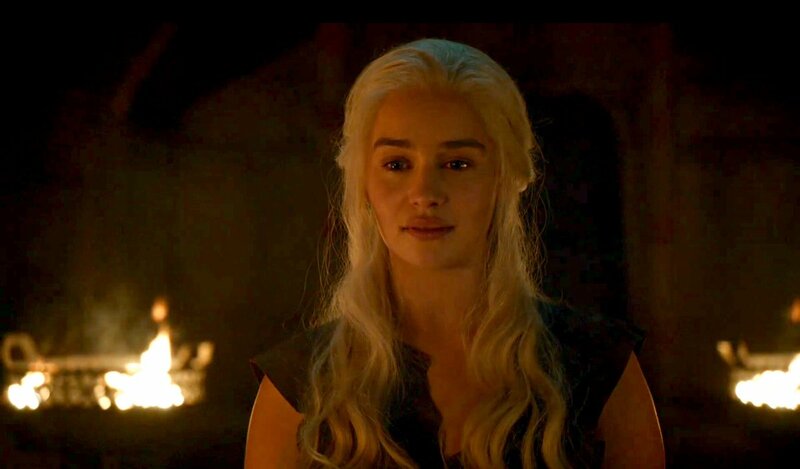 Now in the books Dany’s fire immunity is a sort of a miracle and a one time thing. It happens when she walks into Khal Drogo’s funeral pyre and that was about it. George R.R Martin has always stressed on the fact that it is a huge misconception that Targaryens have fire immunity. Several have burnt to death and what happened to Dany was a one time thing. It is quite different on the show now. They have put it across to us that she is immune to fire and therefore Daenerys Targaryen burnt the Dothrakis fearlessly. Now that the show makers have clearly established her immunity, they have clearly diverted a lot more from the books and that’s what makes it kind of interesting. Readers now have two different plots and interpretations to a show that began on the same premise. Moreover, HBO is definitely giving us a lot to imagine. We are now waiting for these dragons to stand against the White Walkers. As of now, this is how twitter reacted to the latest episode. The Tweets are pouring in people!